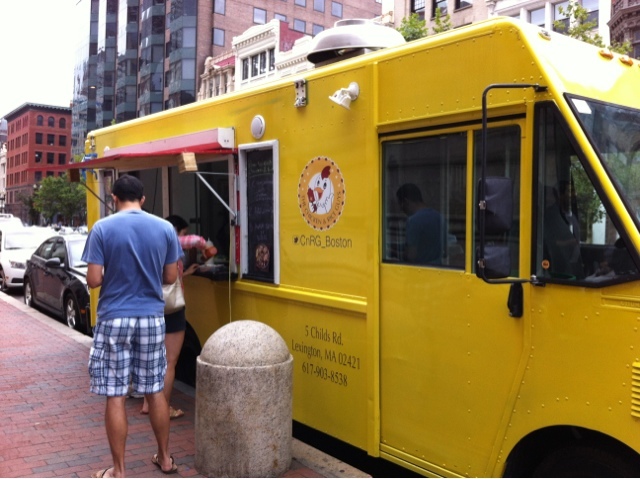 The Chicken Rice Guys is a mobile food truck in Boston, serving Middle Eastern Food like Chicken, Lamb Gryo, Combo mix, and Lamb Sausage. I have always missed the lamb and chicken combo over rice since I ate in Queens, New York. I always wondered whenever I was in Boston why there were hardly any street foods around unlike in New York. In New York, every block would have a food truck or cart selling bagels, honeyed peanuts, and most importantly, lamb over rice. After much research, I found that there were food trucks in Boston. But they were always on the move. The iPhone app - Street Food Boston allowed me to keep track of the trucks and meet them at specific locations to buy food. In the app, I was exhilarated when I found the Chicken Rice Guys. They were two Korean guys who served marinated meat over rice, veggies and pita over white and hot sauces. It was not identical but similar to the Chicken over rice in New York. I purposely travelled to Copley Place and search for the truck. The truck was parked in front of the Boston Public Library. I ordered one which cost me USD 6.00. It was a fun experience and I could wait to have the first spoonful to rice and marinated chicken into my mouth. 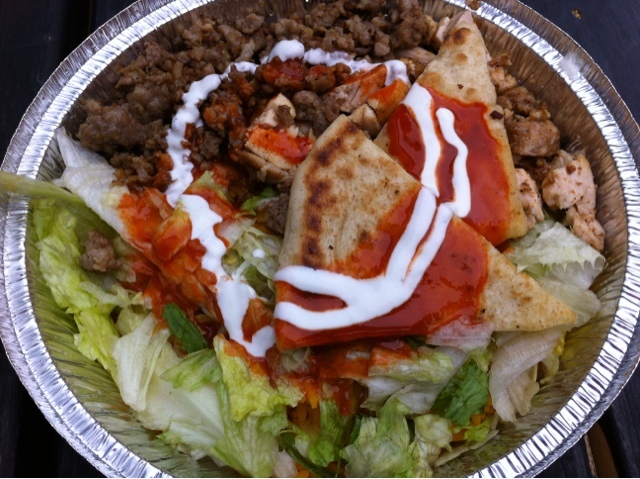 Combo mix over rice was served with marinated chicken and lamb over rice, veggies and pita, and drizzled with white and hot sauce. The food was delicious. I loved the lamb and chicken as it was tender and rich in flavour. The fresh pitas were good too. I would love to have more hot sauce. Though I enjoyed the food, I was hoping that the food could be as good as the ones in New York. It was good but it did not give me that 'oomph'.